Starting from Munich we take the highway towards Salzburg and arrive at lake Chiemsee shortly before lunchtime. You can choose between having lunch on the lake promenade before boarding a ship to Herrenchiemsee island or crossing lake Chiemsee first and then have lunch at Herrenchiemsee. After lunch hovewer, we will join a guided tour through Herrenchiemsee castle which has been built for king Ludwig II of Bavaria (mad king Ludwig), clearly inspired by Versailles castle in France. After the castle guided tour, we continue our lake cruise by ship to Frauenchiemsee island and visit the old nuns monastery with its Roman church. This visit to Frauenchiemsee island is especially nice during springtime when flowers are blossoming. Crossing lake Chiemsee one last time, we go back to Prien from where your driverguide will take you back to Munich. 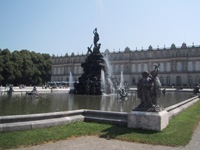 Depending upon how much time you want to spend for your fullday sightseeing tour to Chiemsee lake and Herrenchiemsee castle, the sightseeing tour can be done in many different ways. The team of Munich Tours would be glad to answer your questions about panorama sightseeing tours through Bavaria and to Herrenchiemsee castle and Chiemsee lake and is looking forward to reading from you!